Summer is a great time for salads, with all of the fresh produce available – and available at low cost – there’s no excuse for not including a fresh salad with nearly any supper. Summer salads don’t need to be complex or rely on fussy ingredients; you want the fresh, simple tastes of the vegetables or fruits to be play the starring role. To save both time and money, choose salads that can be made ahead of time or that use produce left over from an earlier supper. And for ultimate convenience, make extra to have for let overs the next day. This first salad uses two of the primary staples of the summer growing season: corn and tomatoes. And even better – you can use corn on the cob left over from a previous meal, if you prefer; just let it soak up the flavors for a little longer. If you’re using fresh corn, cook it first and toss it with the ingredients while it’s still warm enough to absorb the flavors. Cut the corn from the cob. In a large bowl, mix all the ingredients together. 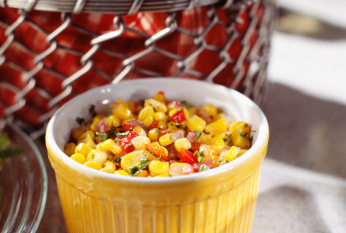 If using fresh corn that’s still warm, chill for 15 minutes prior to serving; is using left over corn, let the salad rest for about 15 minutes to allow the flavors to mellow. This salad can also be made the day before and kept refrigerated until ready to serve. If you like, you can add a little Southwest flavor by adding black beans, a little chopped cilantro and the juice of a freshly squeezed lime. This last option is also good as a main course for vegetarians, since beans and corn make a complete protein. This second salad makes a refreshing dessert, and can also be used as an appetizer to whet appetites made sluggish by the heat and humidity. Or serve it as a side dish, where its citrusy flavors will perk up even the blandest of leftovers. The key to this salad’s zingy taste relies on its use of orange and lemon juices. Fresh juices are ideal, but it’s a good bet no one will notice if you take a shortcut and use prepared juices from your grocer. In a pinch, or if the heat has you too worn out, you can also substitute canned, drained pineapple and frozen blueberries for fresh. Combine the juices and sugar in a saucepan and bring to a boil; reduce heat and simmer, stirring frequently until thickened slightly, about 5 minutes. Cool. Layer fruit in a large bowl and pour the syrup over. Chill for 2 to 3 hours and serve. This salad can also be served with yogurt, ice cream or even pound cake, if you like. 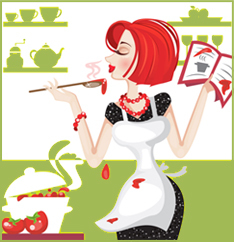 Author Bio: Melonie loves to blog about food and travel. She’s addicted to The Cooking Channel.